• Source of Energy- 100 grams of cashews provide 553 calories and are good source of energy. • Protects Heart- Cashews are rich in monounsaturated fatty acids or MUFA, which lower harmful LDL cholesterol and increases HDL or good cholesterol and thus protects heart. • Powerful Antioxidant- Cashews contain a variety of essential minerals like copper, zinc, selenium, iron and magnesium. These mineral not only prevent deficiency but also removes free radicals from the body and protects us from deadly diseases like cancer. • Prevents Deficiencies- Cashews contain essential vitamins like pantothenic acid, pyridoxine, riboflavin and thiamin. These vitamins help to prevent nutritional deficiencies and play an important role in metabolism of protein, fat and carbohydrates in the cells. • Cashews contain a small amount of zea-xanthin. Zea Xanthin is a powerful antioxidant that prevents age related macular degeneration in elderly. • Cashews make your gums and teeth healthy. • Magnesium and calcium in cashews not only keeps muscles and bone healthy but also maintains your blood pressure. • Cashews contain good quantity of dietary fiber that helps you maintain weight, but only when had in moderation. • Cashews produce the skin and hair pigment melanin and help you maintain your skin and hair color. 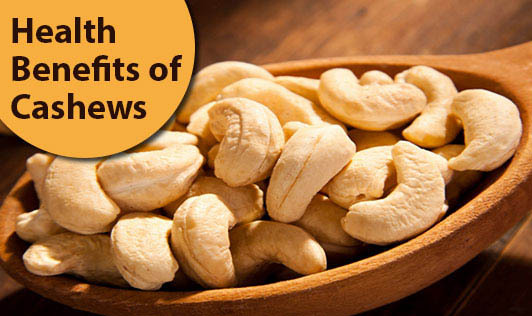 • Cashews are also seen to promote normal sleep pattern in menopausal women. Cashews are absolutely delicious and it is difficult for a person to stop after just a few, but remember moderation is the key. Stick to just 5-10 nuts per day. Have them in place of your junk food and keep yourself healthy and fit.